A new monument that honors the courage and heroism displayed by the men of the Third Vermont Infantry Regiment at the battle of Dam #1 (aka Lee's Mill) on April 16, 1862. 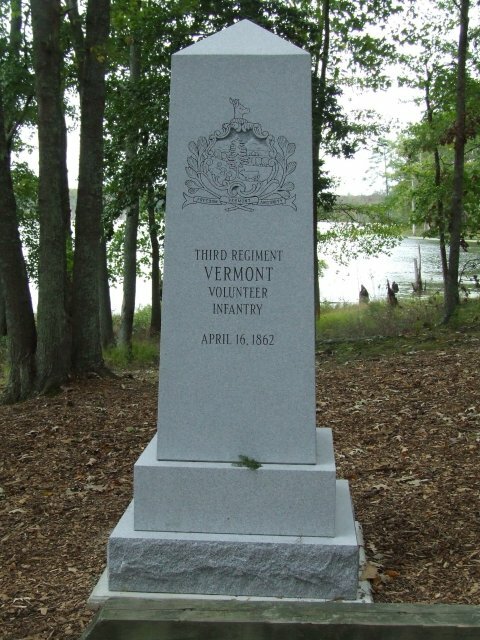 The monument, designed and funded by the Eighteenth Vermont Regiment Inc., was dedicated on October 10, 2009. Made of Vermont granite, it stands at the preserved battle site beside the Warwick River in the Newport News Park, Newport News, Virginia. Contributed by Jim Fouts, past president, Eighteenth Vermont Regiment, Inc.